The Heartland State Trail is one of many long-distance trails managed by the Minnesota Department of Natural Resources. 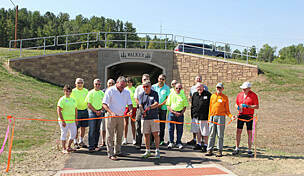 When established in 1974, it became one of the first rail-trail conversions in the country. 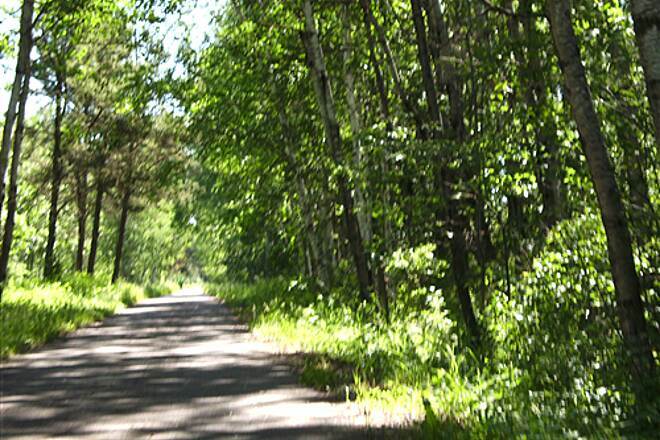 The nearly 50-mile trail connects the small cities of Park Rapids and Cass Lake along a forested route. 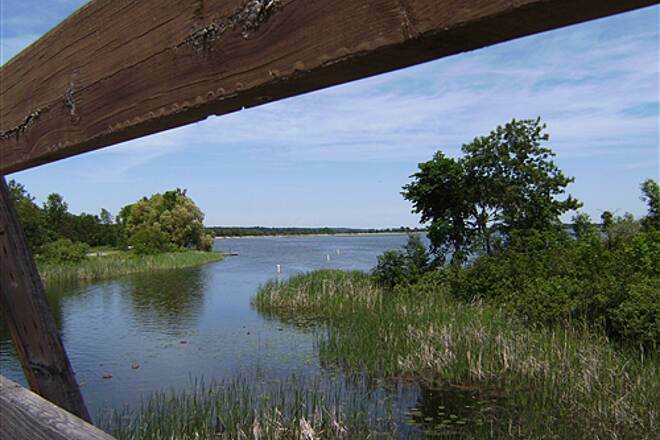 As you might expect from a trail in the heart of the Land of 10,000 Lakes, the Heartland State Trail runs past a number of lakes, rivers, and streams, many of which are directly accessible from the pathway. Public beaches, resorts, and campgrounds also line the route, so be sure to bring your bathing suit and fishing gear. When water is not the primary vista, towering white pine, spruce fir, and hardwood forests offer shade and habitat for various animals, including raccoons, red foxes, white-tailed deer, beavers, and porcupines. 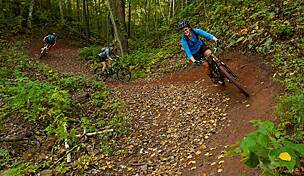 The trail also skirts the edge of both Paul Bunyan State Forest and Chippewa National Forest, home to a large population of bald eagles. 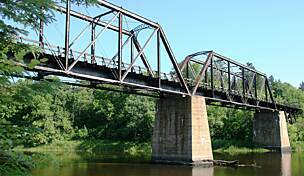 Because the Heartland State Trail is a rail-trail, the trek is fairly level and smooth. Still, those desiring a rest will want to stop in Dorset, Akeley, or Nevis, three small resort towns hosting restaurants and shops. Just west of the city of Walker on Leech Lake, indefatigable trail users can connect directly to the even longer Paul Bunyan State Trail. The Heartland State Trail resumes again where it crosses Morris Point Road at the west side of Walker Bay on Leech Lake. An adjacent grass path between Park Rapids and Walker accommodates both equestrian users and mountain bikers, while a parallel treadway for snowmobilers runs from Walker to Cass Lake. Just north of Walker, a 4-mile segment of the trail leaves the level former railroad corridor, so be forewarned: The terrain here becomes significantly hillier. 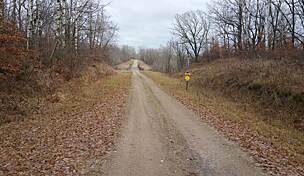 About 2.5 miles south of Cass Lake, the trail crosses MN 371 at 148th Street Northwest (Pike Bay Loop Road/County Road 76), where it links up with the 19-mile, paved Mi-Gi-Zi Trail around Pike Bay. An alternate route at 148th Street Northwest is to continue north along the east side of MN 371 into Cass Lake and follow the streets up around to the northwest corner of the city, where Second Street Northeast/CR 206 swings north to meet US 2; there is a full--service rest stop here on the north side of the highway. Parking is also available on the south side of US 2. 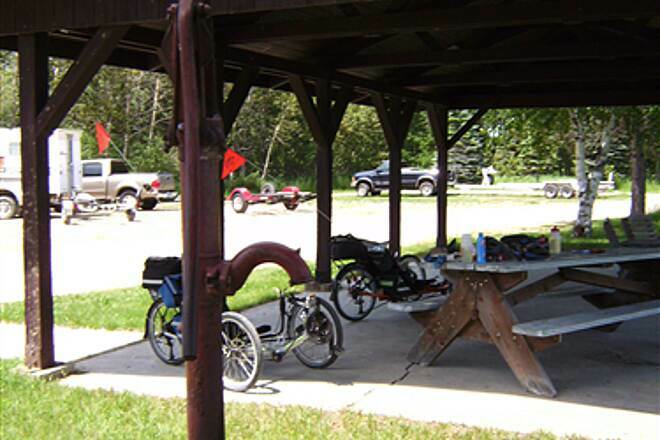 A medium-size parking lot is available in Heartland County Park at the trail’s southern endpoint in Park Rapids, where the trail meets Mill St. From the intersection of MN 210 and MN 371 in Baxter, near Brainerd, head west on MN 210. Go 19.5 miles, and turn right onto US 10. In 18.2 miles turn right onto N.W. Brown St./County Road 23. In 16 miles turn left onto MN 227, and in 0.3 mile turn right onto Hubbard Road/CR 23, which becomes CR 6. In 14.8 miles turn left onto CR 6/MN 87. In 5.3 miles turn left onto MN 34/First St. E. In 0.7 mile turn right onto Mill St., and then make a slight left onto Heartland St. in 0.4 mile. Parking is straight ahead within Heartland County Park. Small parking lots are also available in Dorset, Nevis, Akeley, Walker, Erickson’s Landing, and Cass Lake. 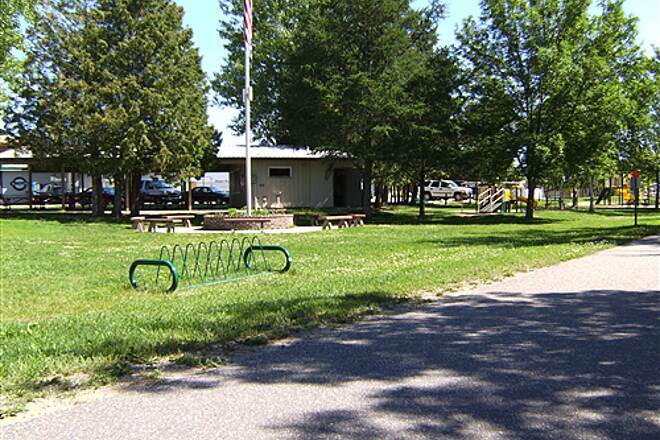 Parking and restrooms are available at Steamboat Lake landing. From the intersection of MN 210 and MN 371 in Baxter, near Brainerd, head north on MN 371. Go 54.3 miles, and turn left onto MN 371/MN 200; continue another 18 miles. Turn left onto CR 141, and in 0.1 mile turn left to reach the parking lot. If you're looking for a good campground on the Heartland, the city campground in Akeley is an excellent choice. It's only a short ride from the Heartland and is situated on a beautiful lake. The tent and pop-up area is separated from the RV part. It has nice clean bathrooms and a small sandy beach and swimming area on the north end. Plus the price is very reasonable. The Heartland is mostly smooth and flat but there are some stretches of worn-out pavement to navigate around. If you stay in Akeley you're at a mid-point to go either north, south or east and connect up with the Paul Bunyan. Last summer a fire destroyed some restaurants in Dorset best known for its many restaurants just off the trail. No idea if they'll be rebuilt. This Trail provides for a nice multi-day ride when combined with the PB. 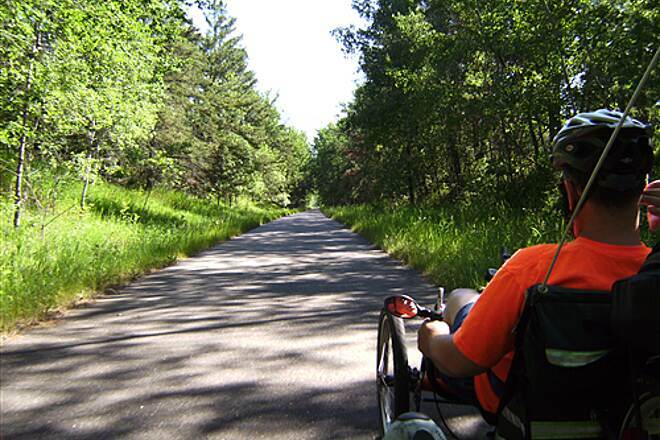 The Heartland and Paul Bunyan trails in the Walker, Minnesota area are great rides. Three of us (70 year olds, one each from Manitoba, Saskatchewan and Alberta) experienced the trails September 24 to 29, 2014. They were glorious days, sunshine and temperatures in the 70s and the fall colours at their best. 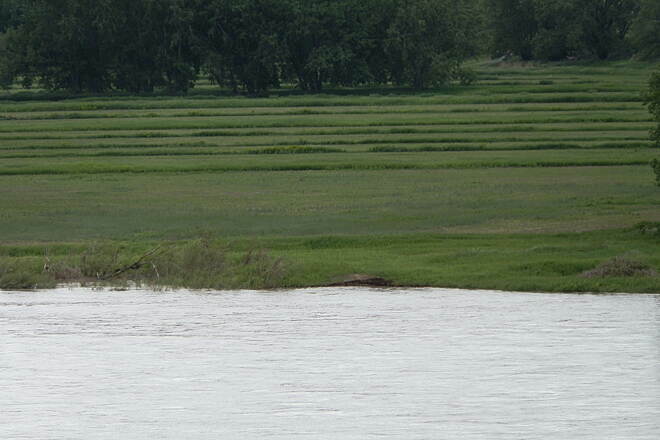 We made excursions each day from a rental cottage on Leech Lake, only one minute from the Heartland Trail. Both trails are easy rides, paved with only slight grades. The first day we biked through Walker on Heartland to join Paul Bunyan near the parking lot on Highway 34 about six miles southwest of Walker. 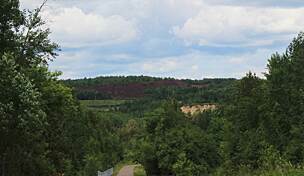 The 7.5 mile section of Paul Bunyan east to the Shingobe Connection is not on a former railway and has a caution for up to 8% slopes and curves, but is a beautiful ride, even for us seniors. We followed the Shingobe Connection back to Walker. The next day we started in Cass Lake, enjoyed a great ride on the Me-Ge-Zi Trail around Cass Lake and then back to Leech Lake on Heartland. 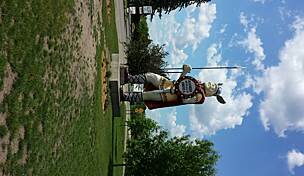 The third day was shorter, Paul Bunyan south from a drop at Nary with a refreshing break at a tavern in La Porte. Our last day we began the parking lot SW of Walker on Highway 34, doing the scenic part of Paul Bunyan again (local riders argue whether it's better to do this hilly section, 'the Pyrenees', from west to east or the other way; we like west to east) and then south for a pick up in Backus. 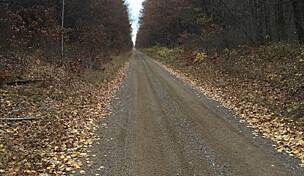 We were lucky to have a fourth person to drive our support vehicle, but connections could be made on paved county roads between the two trails, especially north of Walker, to make round trips possible. We cycled about 25 to 35 miles each day (40 to 60 kilometres does sound further!) but others we met were riding further. Our experience on the rail-trails was certainly positive, and we are recommending this ride to others without reservation. This is one of our favorite trails in Minnesota. Rode from Park Rapids to north of Walker in August. Dorset is always a great stop for food but, unfortunately, the Dorset House (ice cream) and Campaneros (Mexican fare) were destroyed by fire this fall. Hope they will be rebuilt. Lots of other placers to stop to eat. We rode the south half of this trail in 2009 and agree with the review posted by another user that year- the surface was in excellent shape, the scenery is wonderful, but the facilities are a bit sparse. This summer we tried the northern section, parking at the state rest area on US2, riding the marked on-road section through town, and following the Mi-Ge-Zi trail to where the Heartland Trail officially begins. All of this section is along the highway and is not particularly scenic. At mp 41.5 the trail was marked closed for a bridge ahead that is out of service until this fall. It's not safe to ride on the highway, the other detour option was quite long, and we were being attached by biting flies on a very humid day, so we turned around here for a 17 mile round-trip. I might return to ride the middle section of this trail, or ride from Walker south to access the Paul Bunyan trail, a long stretch of pavement that we haven't yet tried. Walker to Park Rapids with a Bunyan side track. Last weekend we took advantage of a special room rate at the Chase Resort in Walker MN and rode the Heartland Trail for the day. NOTE: You will have to ride down the street next to the American Inn for about a half mile to find the trail head on the Walker side. It is poorly marked once you are off the main road but follow your nose and it will show up on the left. The trail is in excellent shape, very fast, very flat and when we rode it was more or less empty until just outside of Park Rapids. Both ends of the trail are beautiful, wooded hills, small lakes, numerous birds etc. The middle section is a little dull and is within sight of HWY 34 for about 10 miles but you do get the chance to sit in Paul Bunyan's hand for a photo so that is a fun break. If you are having lunch in Park Rapids do yourself a favor and eat at the Good Life Cafe, order the home made pretzels you will not be sorry... plus you have to carb up for the ride back. On the way back we took the Paul Bunyan Trail detour through Paul Bunyan State Park. It is a VERY hilly trek. We are on recumbents so it was a challenge to say the least. But every hill has it's down hill side and the ups and downs with high speed twists and turns were fun and the trail is in great shape. Just keep in mind it is about 6.5 miles and it will feel like 15 when your are done. Again watch for the intersection leading you back to Walker. IT IS NOT MARKED. We would have missed it completely if not for a woman coming the other direction who pointed it out. You will head back to Walker on the PB trail and there will be some brief HWY riding on the side of the road. Our total for the day was 68 miles and it was a really good time. The trail from Park Rapids northeast to Walker is superb. It's smooth & almost all the small towns have some amenities (picnic tables, benches, restrooms, etc.). The tiny town of Dorset has half a dozen good restaurants & touristy attractions. The scenery is great & the trail pretty much flat & smooth. Definately worth a ride. Once you get past Walker the quality of the trail (not the scenery) diminishes. The trail cris-crosses Hwy 371 a couple of times & disappears onto a road shoulder for several miles with poor signage. It gets very bumpy & chopped up. No amenities north of Walker. You can go into Cass Lake & then take city streets to get to the MiGiZi trail which is hilly & curvy with some nice scenery. North of Walker this trail will eventually fork off to Bemidji as the Paul Bunyan. Much of it is already done on the Bemidji end. 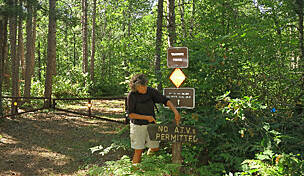 This trail starts at a nice park in Park Rapids. Much of this aphalt trail is in the woods and runs far enough away from the highway to be very quiet and peaceful. The trail is mostly flat from Park Rapids until going slightly downhill into Walker. There are several small towns right on the trail from Park Rapids to Walker that have places to get a bite to eat or an ice cream cone. From Walker the trail runs near Leech Lake giving occasional views of the lake and lake homes around the lake before following along beside Hwy 371 into Cass Lake. The trail dead ends a couple of blocks short of Hwy 2. There isn't any sign to say you have reached the end of the trail, it just ends and there isn't any parking nearby, except along residential streets. I hope that someday they extend this trail to more of a distination, such as the nearby Norway Beach Recreation Area in Chippewa National Forest. "The scenery is great and the trail surface is fair, but don't expect any of the state run bike rest stops to have any services. No picnic tables, no water no trash cans. Shame on you Minnesota"
"The MiGiZee, Paul Bunyan and Heartland Trails are all connected. This is the perfect place to take a vacation and ride! 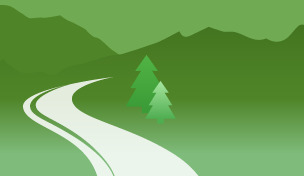 There are over 100 miles of paved trail that is connected. I recommend staying in Walker Minnesota. It is a small resort community with something for everyone on Leech Lake. " 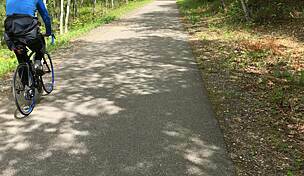 "This trail is now paved (summer 2002) from Walker to Cass Lake. The best scenery is north of Walker along Leech Lake and west from Walker to Akeley. Between Akeley and Park Rapids are small towns that have nice shops to browse in. 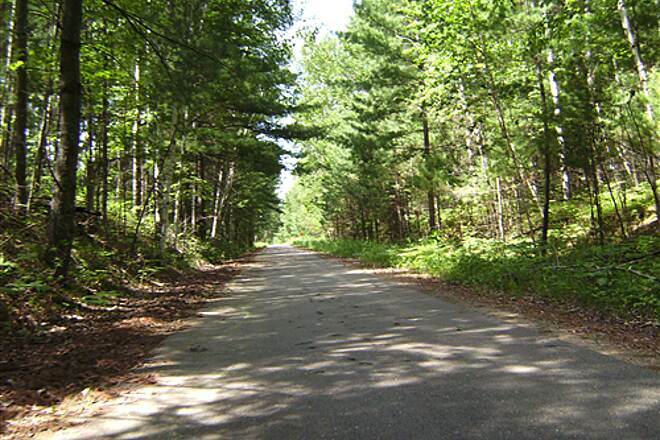 The trail head in Cass Lake is connected to another trail that loops Pike Bay and is in the ""north woods"" Chippewa National Forest. (Paved Fall of 2002) Approxinately 9 miles."